Can you believe I’d never had fried green tomatoes until recently? I’ve always had a funny feeling I was really missing out. So when I stopped by a local farm stand this week and they had green tomatoes, I knew exactly what I was going to do. Turns out, I was missing out in a big way! 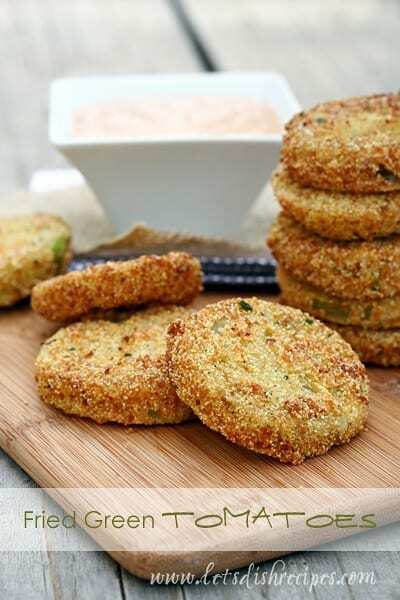 These definitely are the Best Fried Green Tomatoes! Normally, I don’t fry a lot of food. Not because I don’t love it, but because it seems so labor intensive and I always seem to make such a mess of my kitchen. So I was pleasantly surprised by this recipe. It was pretty simple–you probably have most of the ingredients in your pantry–and I didn’t have a lot of clean-up afterwards. Even if I did make a huge mess, it would have been totally worth it, because these fried green tomatoes were absolutely fabulous! The cornmeal really adds the perfect Southern flair to this recipe, if you ask me. Admittedly, I have no idea how they make fried green tomatoes down south, but I like to think they use cornmeal. Either way, I thought it was the perfect touch. I urge you not to skip the dipping sauce, because as good as the tomatoes are on their own, the sauce makes them even better. If you don’t have buttermilk available, regular milk will work just fine. Heat oil in a large saute pan over medium heat. There should be about 1/2 inch of oil in the pan. Slice the tomatoes about 1/4 inch thick. Whisk the eggs and milk together in a medium bowl. Place the flour in a shallow dish. Mix together the breadcrumbs, cornmeal, salt and pepper and place in another shallow dish. Dredge the tomatoes in flour to coat, then dip into the egg mixture. Dip in the breadcrumb cornmeal mixture and coat completely. Place tomatoes in oil in small batches. Fry tomatoes for 1-2 minutes, until golden brown on one side, then carefully turn and cook on the other side for an additional minute or two. To make dipping sauce, whisk all ingredients together in a small bowl until smooth. That’s pretty much how I fry my green tomatoes here in Alabama. I only use cornmeal and flour, never breadcrumbs, but I could see how that would appeal to people. I don’t particularly like to deep fry (it’s to messy) but I don’t mind frying tomatoes because you don’t need that much oil. 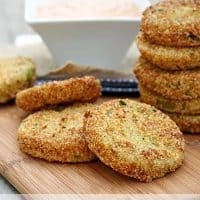 I would never dream of serving my fried green tomatoes with anything but remoulade, unless I was serving a fried green tomato BLT slathered with mayo.